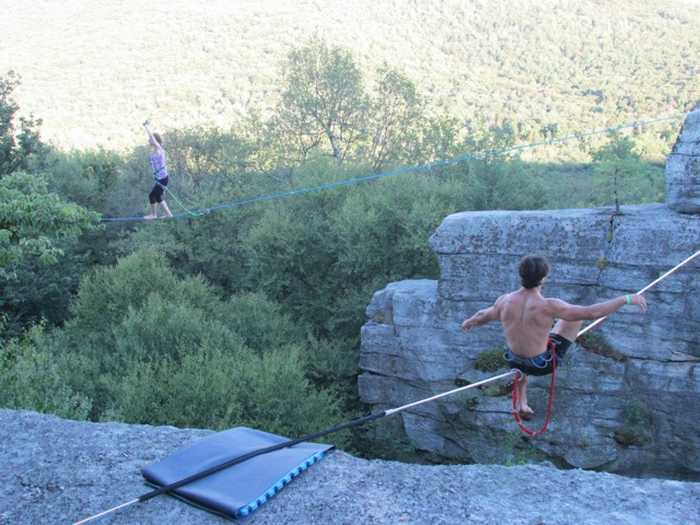 The GCC embarked on a major letter writing campaign to encourage NY State to provide more opportunities for climbing in Minnewaska State Park Preserve. Volunteers signed up to help, and attended climbing competitions, ice festivals, crags, and climbing gyms to collect hand written letters that were mailed, en masse, to the NYS Office of Parks and Recreation. 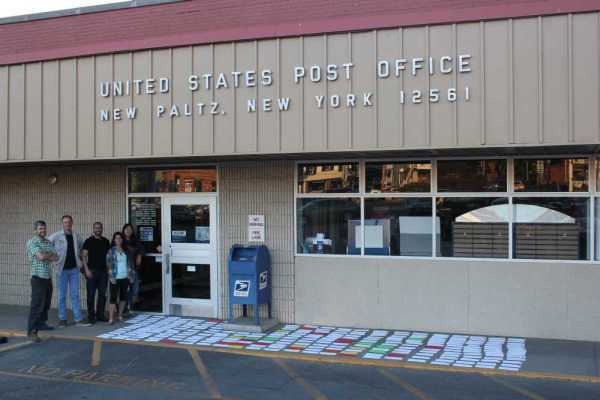 Close to 300 letters were mailed on May 15th, not to mention the letters people personally mailed, and the Access Fund Action Alert online letter writing tool. 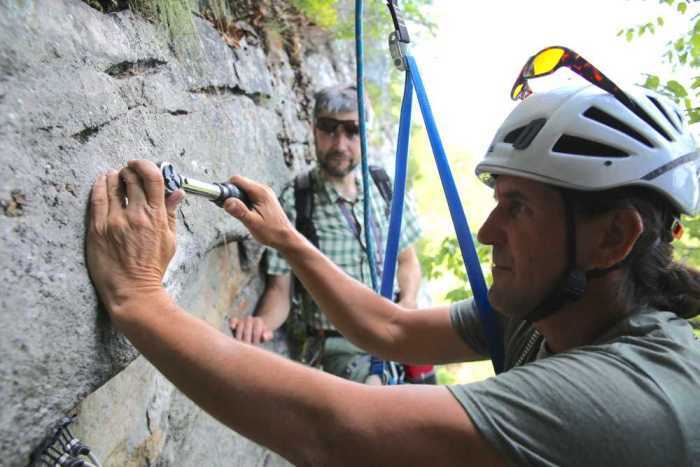 Thanks to your letter writing efforts, we got the attention of the New York State Parks Commission, and they are discussing an expansion of climbing access in Minnewaska. The parties agreed to embark on a new and productive relationship that would provide greater clarity to all stakeholders on a range of climbing issues, resources, and opportunities for collaboration to solve once-perceived obstacles. Most significantly, the parties agreed to enter into a written Memorandum of Understanding that will solidify our working relationship with New York State and clarify our mutual commitments and objectives. 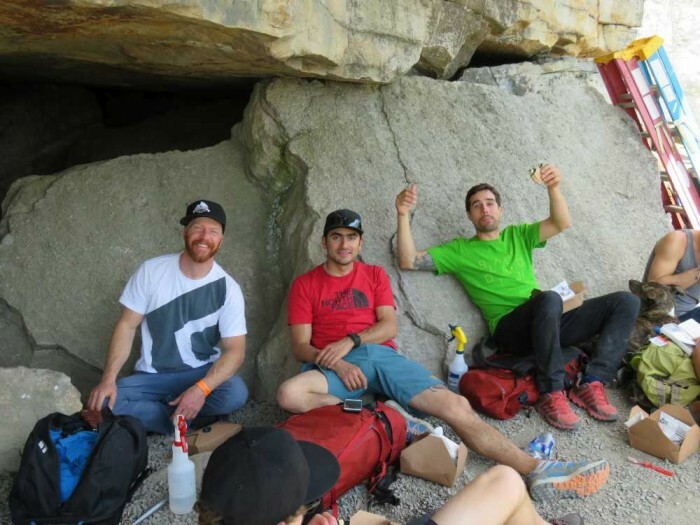 The Access Fund & Black Diamond ROCK Project Tour of 2015 came to New York in early May and the GCC was there to participate and host the finale party. 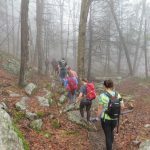 The fee for the participants included a dual Access Fund and GCC membership, access to clinics, food, parties, and transportation to and from Brooklyn to the Gunks and back. Professional climbers participating included Alex Honnold, Joe Kinder, Sam Elias, Brittany Griffith, Angie Payne, Chris Schulte, and Whitney Boland, with appearances at some events by Ashima Shiraishi and Sasha DiGiulian. Access Fund representatives included Executive Director, Brady Robinson and Education Director, Travis Herbert. Representatives from Black Diamond as well as the media also attended. The weekend event stated with a Friday evening gathering of notable Gunks climbers, gym owners & pro climbers for a Roundtable Discussion to discuss the challenges & solutions to educating the growing climbing population in May of 2015. 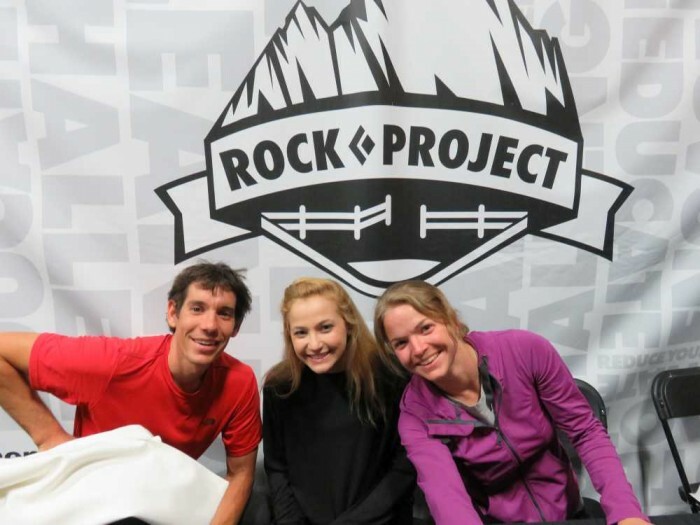 Saturday’s activities were held at Brooklyn Boulders gym with a full day of clinics with pro climbers, presentations, poster signings, food, beer, raffles, and a strong message about responsible climbing. The following Sunday morning participants were bussed to New Paltz for breakfast at Rock & Snow and worked on a land stewardship project alongside pro climbers to clean chalk of off the Gunks most popular boulder problems. 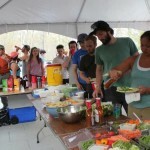 Sunday night, the Access Fund ROCK Project combined with the Gunks Climbers Coalition BBQ for our members-only BBQ at the Mohonk Preserve Visitor’s Center. 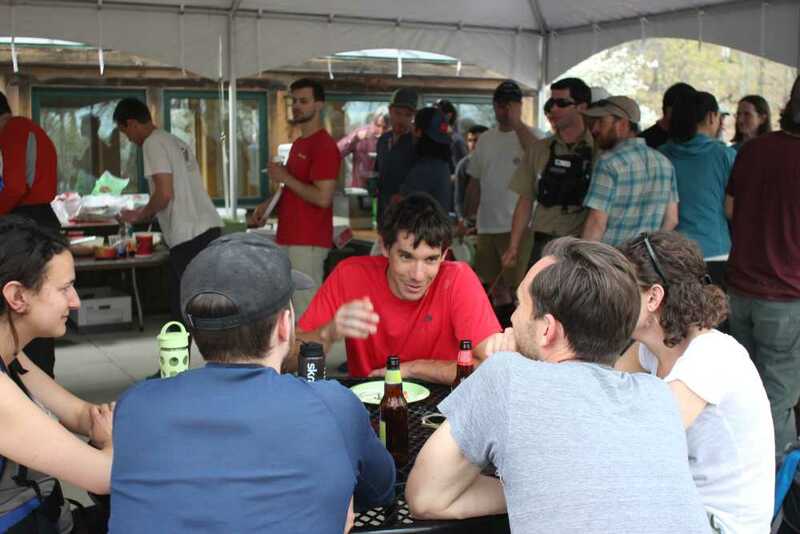 Around 200 climbers came to eat, drink and mingle with the pro climbers and Access Fund reps.
Pros Chris Schulte, Sam Elias and Joe Kinder relax for lunch. The event was a huge success with the largest turnout ever for our members-only BBQ. The GCC gained many new members and the message of land stewardship was loud and clear. 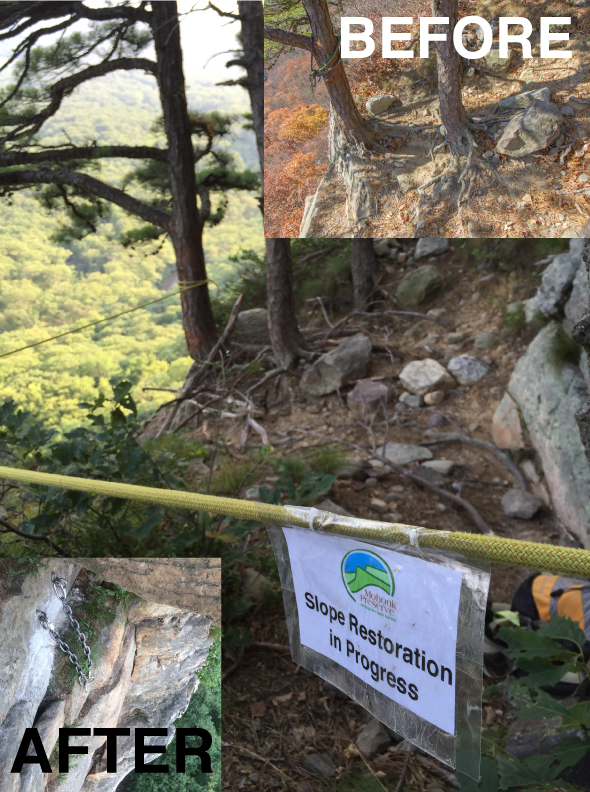 The Gunks Climbers’ Coalition has been working with the Mohonk Preserve to address rappel anchors, advocating for bolted anchors to replace tree rappel anchors where trees are suffering from climber impact. The Anchor Evaluation Committee was created to evaluate the highest priority rap anchors, formulate a plan, and work with the Mohonk Preserve to implement the plan. The team initiating the effort was Christian Fracchia, Dustin Portzline, Jason Hurwitz, and Jason Beaupre. This committee spent countless hours surveying climbs to determine the rap anchors causing the most environmental damage and presented their findings to the Mohonk Preserve. Jackie, Betty and Baby: Bolted Fixed Rappel Anchors have been installed and slope restoration areas have been roped off at the top of to move climber traffic to more durable rock surfaces. 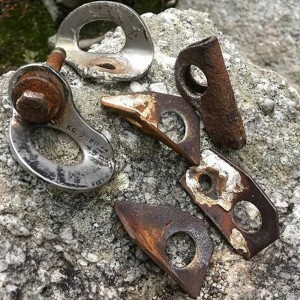 Beginner’s Delight: Bolted anchors were placed left of Beginner’s on pitch 2 of Blueberry Ledges and near the top-out of Beatle Brow Bulge. Snooky’s/Tipsy Trees: The tree at the top of the second pitch of Tipsy Trees has unfortunately died but still had rappel slings on it. A new bolted anchor left of Minty and right of Snooky’s second pitch allows climbers to go down where the old Snooky’s tree rappel used to be. Middle Earth: All tree anchors were removed and replaced with bolted anchors away from the root systems. No Glow: The tree on the GT ledge near No Glow required a double rope rappel forcing traffic to the dying Moonlight Tree. A new set of anchors allows a party to descend from the top of No Glow all the way to the ground by doing three rappels with a 60m rope. Climbers topping out on Moonlight, Erect Direction, Keep on Struttin’, No Glow, and Andrew can use this lower impact alternative to descend. Arrow: The top crux bolt was easily broken with 1/8 of a turn by a wrench! Never Never Land: The pin was pulled out by hand! J’Accuse’s bolts had mixed-metals (stainless hangers and non stainless bolts) with possible galvanic corrosion issues arising in the future. Our webmaster, Jannette Pazer, finally found the time to redesign our GCC website, with gorgeous photographs, most taken by Christian Fracchia. We now have an official blog and it’s easier to post new news and announcements to the website. 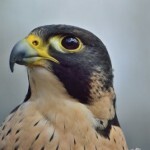 We invite you to visit our site and read our blog at http://gunksclimbers.org. We are seeking volunteers to help write new content for the site, especially Gunks beta to help visiting climbers (e.g., places to eat, stay, things to do on rest days, climbing information), or contribute blog posts (trip reports, interviews, route beta, stories, technical how-tos, land stewardship reminders, etc.). If you’re interested, please contact us and let us know what you’d like to write. 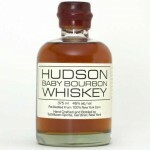 Climber owned Tuthilltown Spirits, international distiller of award winning whiskey in Gardiner, asked the GCC to invite all Gunks climbers for free tours and tastings on Saturday, September 26th if they showed their Mohonk Preserve climbing pass. 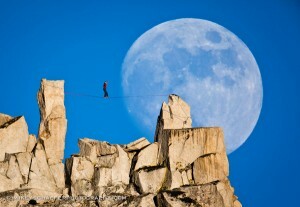 Redefining Balance puts on retreats combining yoga, slacklining, rock climbing, surfing and other outdoor adventures in a variety of locations around the world. They donated 5% of the proceeds of their New Paltz retreat to the GCC to support their efforts to protect the safety and environmental integrity of the local climbing areas in New Paltz. 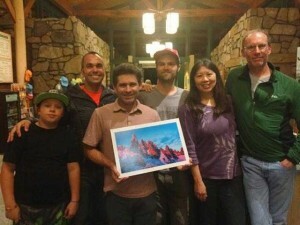 As part of the New Paltz Climbing Film Festival, The Mohonk Preserve held a Climbers’ Reception on October 9, 2015 with Patagonia Athlete/ Ambassador Mikey Schaefer. Mikey is an accomplished photographer and sold a selection of prints of several of his most interesting images with all proceeds going to the Gunks Climbers’ Coalition, a significant contribution! The Cliffs at LIC held a benefit raffle at their Reel Rock 10 Film Screening & Halloween Party on October 30th. The GCC had a table to provide information and sign up new members. All proceeds from their raffle were donated to the GCC. 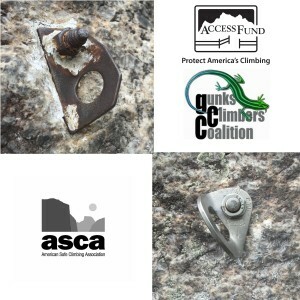 As mentioned above, The ROCK Project, organized by the Access Fund and Black Diamond, provided many new memberships to the GCC and awareness of the importance of land stewardship. Last but not least, we greatly appreciate the Mohonk Preserve, not only for their support of climbing and the GCC, but allowing the use of the Visitor’s Center for our events. We thank all organizations who have supported the GCC and look forward to more partnerships in the 2016. In 2015, we announced Sandi Trillo joined the GCC Board. Due to moving to New Hampshire, founding GCC board member, France Menk resigned from the Board. We thank her for her 13 years of service to the GCC. Our fall members only BBQ was cancelled due to the forecast terrible weather and the unpredictable path of Hurricane Joaquin. With the film fest the following weekend and the season getting late, cancelling the party was the logical thing to do. However, we look forward to another amazing Spring BBQ, hopefully in conjunction with another ROCK Project Tour. 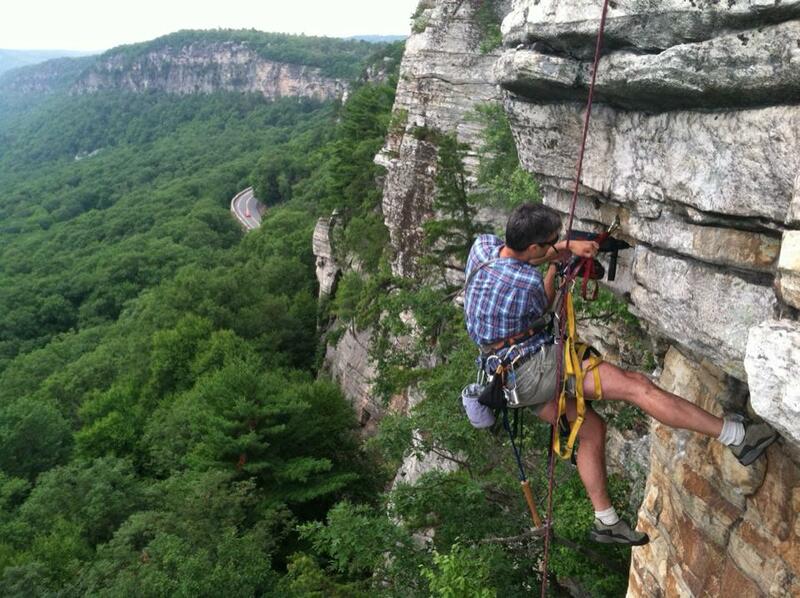 It’s election time, and the Gunks Climbers’ Coalition will be holding elections for the next slate of directors. If you’re interested and willing to commit the time, let us know! Ethan Ladof has recently joined the board and will be heading an initiative to build our volunteer base. We will be looking for GCC ambassadors in the NYC/NJ areas to represent us at events in various locations and climbing gyms. We are researching possibilities for future land acquisition projects. If you have experience in real estate related fields like appraisals, insurance, surveying, real estate law and fundraising, and would be willing to donate your expertise and services to the GCC, please contact us. Thank you to everyone who participated in Gunks Climbers’ Coalition activities in 2015 and lent your support. Please make sure your membership is up to date in 2016 and let us know if you’d like to volunteer your time and/or your skills. Quick question … I see that the pin on Fat City was not mentioned as a piece of old fixed gear that was replaced. Was that old pin replaced previously? Or does the really super old one remain in place?